I have been a huge fan of Ed Gray’s art since I first set eyes on his work about five years ago at his Sun & Doves exhibition. I liked it even more when I found that he lived in Bermondsey, so it is always good to hear that he has another exhibition of new works coming up soon. His last show – Glitter and Grime – captured London in all its dirty glory, with the paintings taking us into the everyday minutiae of city life. And that’s what Gray does best, the social interaction between cultures and races in a thriving urban landscape. His new show, Transmetropolitan, continues the trend, with pictures of the hustle and bustle in recognisable locations. 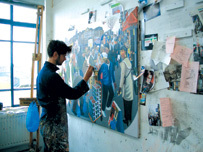 “It’s a good, descriptive word for what I intended the show to be; I want the viewer to experience a journey throughout a year in London,” he told me when I made my own journey through London over to his East End studio. The show’s title comes from a Pogues song. Ed is a great lover of music and many of his works have been inspired by lyrics and titles. Ed Gray taught art in Southwark schools before breaking out of the classroom and carving a niche of his own. He has since become the Chronicler of our Time, painting such varied subjects as betting offices, night clubs, pubs, markets, buskers, night buses and train stations, all peopled with those that make up our diverse population. “There’s too much happening in the city,” he says. “I’m constantly seeing new things I want to paint but I can’t keep up with it as the paintings take so long.” This inability to capture everything of interest clearly plays on his mind, but working in quite large scale means that there is only so much of life that can be caught on canvas. But that doesn’t mean he is not trying, working twelve hours a day for up to nine months of the year. A hectic schedule that he seems to thrive on. I was surprised to hear him say that on his frequent journeys to Sweden, where his wife Ingrid hails from, he does sketch rural landscapes of trees and lakes. “It’s a kind of release from what I’m doing here,” he explains. But his heart is definitely in the fast pace of urban living. He laughs as he tells me that he painted landscapes when he taught in Cornwall but ended up painting the night clubs there. One might think that Gray’s work and style is unvarying but he tells me how each show has evolved from the last: “It’s more complex in terms of things that I try and do, and more accurate in terms of what I’m seeing… The colours are richer and the drawing’s better… I’m researching places more than I used to.” He goes on to tell me how he spent two days in Whitechapel Market “soaking up the atmosphere”. 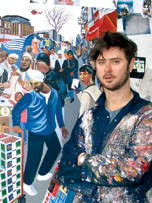 Gray began work on this latest show straight after the last one ended and this was a mistake, he feels, and meant he did not finish any of the paintings he had started for the first four months, even painting over a Bermondsey Market scene that he was not happy with. He has a strict mindset to work and knows he has to get out sketching and refreshing himself for a while before getting back into the studio. This obviously pained him as I know how keen he was to capture that Bermondsey Market scene before the developers completely changed it. Since I have followed Gray’s career I have seen the prices rise from around £3000 to £12000 for an original. The new works are on offer for between £10000 – £16000. He has regular buyers who keep coming back for more, plus new customers every year. It is a career that deserves to continue rising as Ed Gray is very good at what he does. We spoke of why he had no pub scenes in the forthcoming exhibition. “Pubs are changing all the time now; they don’t seem to know what they are anymore… I miss the old smoky pubs.” Having spent some time in pubs with the artist I know he likes a pub with characters in it, and the freedom to have a roll-up. As we neared the end of the interview he told of when, as a child, he first saw the extraordinary images created with a fish-eye lens, and this is something he has drawn on to get more into his paintings: “I want you to feel that you could step into the painting and walk down that street.” Ed Gray’s paintings all look like you could step into them and become part of the action. “My work is aimed to be a celebration of city life,” he says. And it is. The exhibition will have about 20 drawings as well as the paintings, and reproduction prints of all the work will be available.